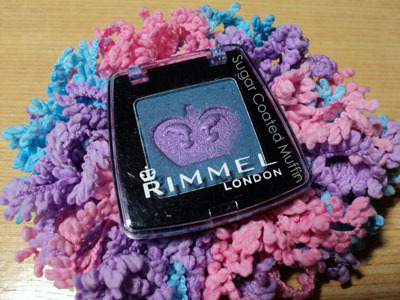 I don't buy eyeshadows anymore since my small collection doesn't seem to be getting the attention it deserves but this Rimmel mono eyeshadow was just too pretty.. I don't like the plastic cover though cos it gets scratched easily but hey.. Priced at just RM14.90, I can't complain.. The clear cap does makes it easy to see the shade ^_^ Love that it's small too. Without an applicator (which are usually quite useless), the packaging is not bulky at all. That was until.. I got the product from Yuberactive and took a closer look. The coloured part in the crown was just overspray!! =_= LOL Darn.. 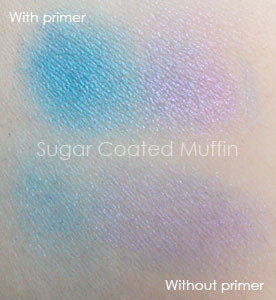 I still swatched the purple anyway *pouts* This eyeshadow is soft! Don't be too rough or you'll have powder flying. By itself, pigmentation is pretty weak but it's greatly improved with a primer/base. The colour wasn't quite like how I expected as it turned out to be a soft shimmery shade that looks kinda mystical instead of an in-your-face blue. 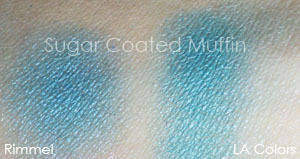 The moment I saw the swatch, I thought it was similar to the blue in my L.A. Colours Tease palette. 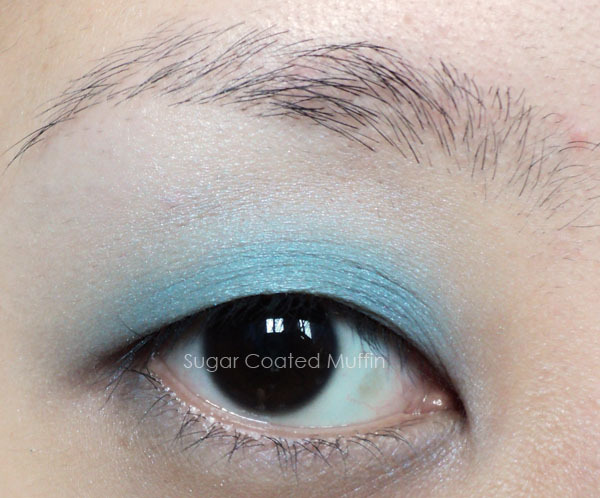 Well, Rimmel is less pigmented, a softer blue, shimmery, easier to blend and looks creamier. The colour is similar but obviously not the same. I prefer Rimmel since I'm not into intense blues. I'm showing you this ugly picture of my eye cos I think the shimmers look really pretty here lol See the sacrifice I make for you readers?! The lighter blue parts are applied with brush and blended out. I had to apply more on my lid using my finger to make the colour show. 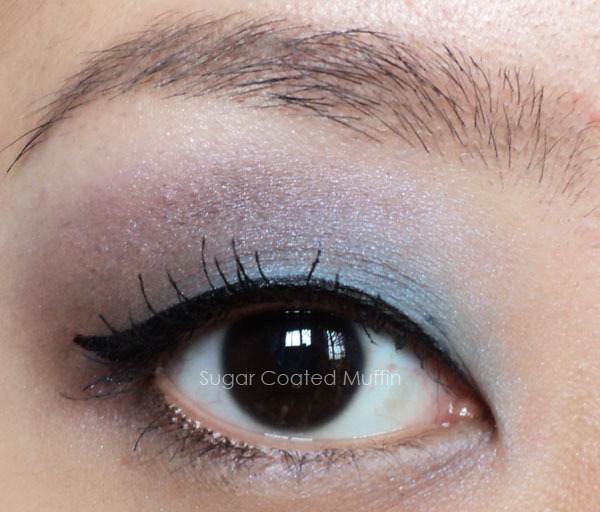 This eyeshadow is super easy to blend but it can be too sheer for some people. Added purple to it. Sorry if it looks odd. This is why I don't really wear eyeshadows (and why I should wear my contacts when I do my makeup =_=). The shimmer still peeps through from under the purple eyeshadow and I think it looks gorgeous! 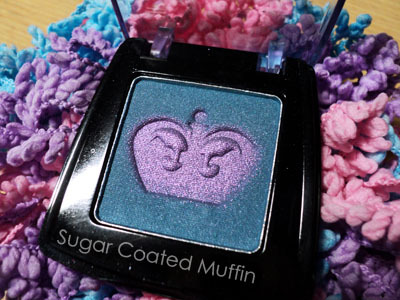 Product says : Super soft blendable eyeshadow that lasts for up to 8 hours. 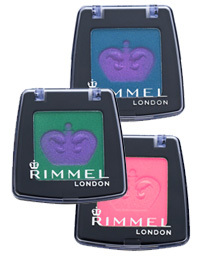 Creamy pressed powder texture delivers bold colour with long lasting wear. Complimentary shades in convenient compact. 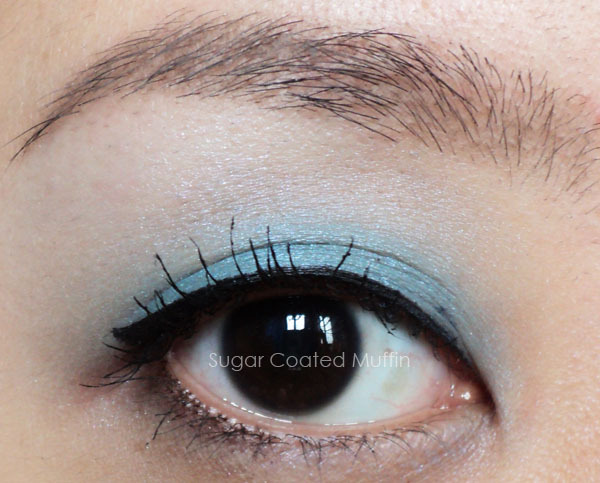 My conclusion : I don't like wearing blue eyeshadow but I can see the possibility of me wearing this ^_^ It's good if you wanna wear shades you don't usually wear but don't have the guts. You're just being silly! Your eyes are beautiful without lenses as well (we seem to have the same dark shade of brown!) I agree with you that this isn't a truely vivid color, it's more dreamy. But it looks lovely on you. Definitely more bolder with primer but I agree it's not in your face bold. I find the shades quite pretty though.